Top 10 Latest Insurtech Trends in 2017 | ODosta Inc. The beginning of a new year 2017 is a perfect time to predict the major trends for the next twelve months, including the development of insurtech. Most lists focus on the latest technologies and applications, but usually they are hardly broken after a year. We address it differently, better. Here you can find Top 10 Latest Insurtech Trends in 2017. The beginning of the new year is the perfect month for good intentions. In our work as consultants for a large number of insurers, and as speakers at conferences and in boardrooms, we meet almost daily managers who guide the insurance industry. Therefore, we have a pretty good idea of ? 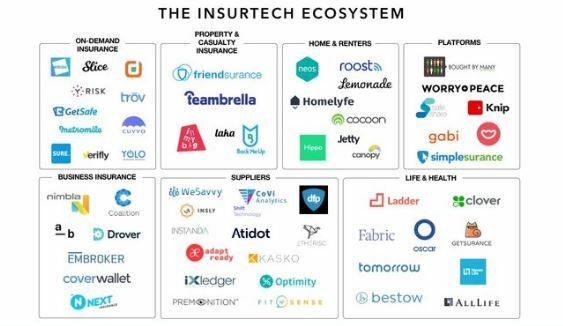 ?what it says at the top of their agendas, the pace at which change occurs and what insurtech solutions fit with these plans. These insights form the basis for our Top 10 Insurtech Trends for 2017. Already a major trend, of course, but also one that will continue even further in 2017. A large number of insurance companies has a combined ratio of close to 100 or even more than that. The digitization of existing processes is essential for operational excellence and cost savings. Digital transformation began in the insurance industry in 2015, really came to fruition in 2016 and will be embraced across the board in 2017. Almost every insurer that takes itself seriously, big or small, is always looking for ways to work more efficiently: in claims, but also in operational and acquisition costs. Thereby further investment in technology taking by insurers, as well as the growth and number insurtechs that responds to that need. The OutShared CynoClaim solution can automatically handle more than 60 percent of all claims, leading to lower costs and higher customer satisfaction. Results of the first implementations: up to 50 percent cost reduction, 40 percent higher customer satisfaction. It takes six to nine months to deploy the solution, whether it is setting up the platform from scratch or migrating from existing operations to the platform. For the insurance industry quite spectacular. Ultimately, digital processes and a lower cost base more than preconditions for a successful insurance company. It is not enough in a world of rapidly changing customer behavior, a dynamic market and intensified competition. No insurer has ever managed operational excellence to turn into long-term competitive advantage or something that is truly distinctive. More and more insurance companies are realizing that engagement innovation “the next phase of digital transformation. From a customer perspective, this is not a new container or marginal improvements, but a real makeover. Innovation in Engagement is not just about customer experience, but customer-centric products, new value-added services and new business models. Insurtechs helping insurers to innovate in customer engagement, have a good 2017 in anticipation. AMODO directs insurers to the new generation of customers. With AMODO’s ‘connected customer suite’ insurers are able to attract and retain customers in this segment by digital channels and connected devices, such as smartphones, connected cars, and wearables. AMODO collects data from smartphones and various other devices to create a holistic customer profile. So insurers better understand the risk and product needs of individual customers. By analyzing the insights to develop insurance risk prevention programs, individual pricing and personalized and ‘on the spot’ products that increase loyalty and customer lifetime value of the customers of the future. Many insurers have started in recent years with IoT initiatives. Especially in motor insurance is already common, with Italy leading the way. Home Insurance is behind and care and life insurance even further. learning in all pilot projects and experiments insurers that proper data management capabilities fail to deal with all the new data streams. Not only with the amount of data and new data sets, but also to translate this data into insights and translate these insights into relevant and distinctive value propositions and customer engagement strategies. Insurtechs engaged in everything around advanced analytics and Artificial Intelligence (AI) can rejoice in the interest of a growing number of insurers, the potential and value of IoT really wants to cash. Diamond Award winner BigML has developed a machine learning platform that advanced analytics accessible to businesses of all sizes. An intuitive web interface and end-to-end automation you need to be a PhD to use the set of algorithms. BigML democratizes as machine learning. For many customers, Big Data means the same as ‘Big Brother’ and the insurers who use personal data is not welcomed immediately. Very understandable, of course. Most data initiatives by insurers deal with advanced pricing and risk reduction, and therefore cost savings for the insurer. However, the added value for customers in the current initiatives is limited. Chance of a lower premium, nothing more. To truly take advantage of ‘connected devices’ and the data associated therewith, insurers must address the concerns around privacy. On the one hand to give more than to take and to offer more added value with respect to personal data. On the other hand insurance customers should enable them to manage their own data. Ultimately, it is namely their data. Expect rapid growth insurtechs that help insurers privacy issues to go. Traity (another 2016 Diamond Award winner) enables customers to have control over their own reputation. Traity uses all kinds of new data sources, such as Facebook, LinkedIn and AirBNB, to help customers to prove their reliability. Munich Re’s legal DAS brand has partnered with Traity to offer new kinds of services. Push is becoming less effective; pull is becoming increasingly important. Until now, insurers have their customer engagement strategies and capabilities needed there but hardly adjusted. In 2017 we see the shift to pull platforms as part of commitment to innovation. Where push is about forcing products to customers, will pull on the understanding and solving real customer needs that underlie the insurance solution and are present in this context. Risk considerations make customers find not normally be in the office of an intermediary, or while visiting the insurer’s website. Insurers must be present in the context of everyday life and life events, and that offer new services in addition to traditional products. Insurtechs providing a platform or give access to the broader context, help insurers to be more part of the lives of customers and more part of the ecosystem in that context. Hence they add much more value for customers. Vital Health Software Founded developed include Mayo Clinic, eHealth offers solutions for people with chronic diseases such as diabetes, cancer and Alzheimer’s. All kinds of services for patients, insurers and health care providers who work in health networks and have access to protocol-driven disease management support. All seamlessly integrated with electronic medical records. Vital Health Software is used by insurers who want to improve care and at the same time to reduce costs. Among other osde, the largest health insurer in Argentina and Chunyu Yisheng Mobile, a fast-growing Chinese eHealth pioneer with approximately 100 million registered users, which is closely linked to People’s Insurance Company of China (PICC). Marketplaces: we see that this business model is emerging in the banking sector and we expect dar insurance industry will follow soon. Almost every insurer has its own range of products, mostly developed internally. More and more insurance companies are realizing that you can not be the best in everything and that there are too few resources to keep up with every new development or to respond to each customer segment. The marketplace model insurers give their customers access to third parties with the best products, the most pleasant customer experience and the lowest cost. At the marketplace model, the knife cuts both ways. On the one hand customers have constant access to the best products and services in the market. On the other hand the cost limited by real-time connection with third parties continue to make it possible to directly respond to customer needs, and anticipate other market developments and at the same cost to variable. In 2017 we are witnessing all kinds of partnerships between insurtechs and established parties that fit the market model. AXA entered into a partnership with the acclaimed 2016 Diamond Award winner Tr?v to focus on UK Millennials. Tr?v provides household insurance measure by a cover on individual products rather than a one-size-fits-all coverage based on average amounts. There is an ecosystem is emerging. With parties that generate and collect data (eg providers of connected devices) and parties that are developing new value propositions based on those data. Insurers need to cooperate more with other companies in the ecosystem than they do now. If an insurer wants to exploit the opportunities presented data structurally, it is not just about the efficient and effective organization of processes, but also facilitate interactions between potentially very different users that have to do with each other in one way or another. the banking sector is also here for the insurance industry. For our new book, “Reinventing Customer Engagement. The next level of digital transformation for banks and Insurers’, we spoke with many bankers. German Fidor Bank has set up an open API architecture, fidorOS, fintechs which enables it to develop financial services on top of an existing legacy system. Citi says that “every financial institution that does not want to lose market share very quickly, need to work with a more open architecture structure. When Goldman Sachs, Morgan Stanley and Banco Santander decided to leave the R3 Block Chain Group, many thought that this was proof that the block chain technology apparently was not as promising as initially thought. The opposite is true. It is not uncommon for you to join a consortium to accelerate the learning curve, then leave this consortium and with the knowledge to make your own plans to gain competitive advantage. Especially with a technology as powerful as block chain. We do not believe that a similar scenario will unfold in the B3i initiative AEGON, Allianz, Munich Re, Swiss Re and Zurich. Cooperation and ecosystems is much more in the blood of insurers. In addition to imagine there are plenty of use cases within ensure that the application of block chain leads to improvement in both operational excellence and cost efficiency and customer engagement. That’s good news for the insurtech precursors in block chain technology. Ever Ledger takes the massive fraud and theft in the diamond industry. The company offers an unchanging ‘ledger’ for diamond owners and related transaction history for insurers and uses the block chain technology to track objects. Ever Ledger is working with all parties in the entire diamond value chain, including insurance companies, legal bodies such as Europol and Interpol and certification companies around the world. By Ever Ledger’s API everyone has access to the data and the status of a stone, including police reports and insurance claims. Algorithms generate at this time especially headlines about making people redundant. Opinion robot will undoubtedly affect the labor market. From a cost perspective this seems attractive, but from a customer perspective, this may be different. To develop a relationship with customers, financial institutions need to show emotion. People use emotion, empathy, passion, creativity, and may differ from procedures as needed. Banks and insurers must make digital a similar connection. Given the tens of thousands of people working in the financial sector, it is also possible to create the best of both worlds. We see the first insurers to deploy robot advice to support frontline employees. This leads to better discussions, higher conversion and better solutions for customers. AdviceRobo provides insurers preventive solutions by combining data from structured and unstructured sources, and machine learning to use to predict customers’ risk behavior. For example, the prediction of default, debt payments and outflows. The predictions are actionable because they are at the individual customer level and frontline staff support as they talk with customers. Among other Menzis uses solutions AdviceRobo. Relationships between insurers and insurtechs be intense. All the examples in the previous nine trends make this clear. Insurers look for ways to learn more from insurtechs which they invest. Whether it comes to specific skills or specific instruments for the existing organization, or culture or process at insurtechs. We see an increasing number of insurance companies applying lean startup methodologies and internal accelerators have been created to enable innovation Take. What does Aviva with its Digital Garage in London and Singapore is a perfect example of the realization of such symbiotic relationships. The Digital Garages are not just ideas labs, but where Aviva runs its entire digital business. MyAviva of a number insurtechs where Aviva Ventures invests. Everything under one roof to build an ecosystem and create synergies on many levels.